Spent most of the day in bed, with all the lights in the room on, snuggled up in my freshly laundered white bedding (so it's like I'm floating on a cloud) with my favorite companion, the internet, via my laptop. Yes. 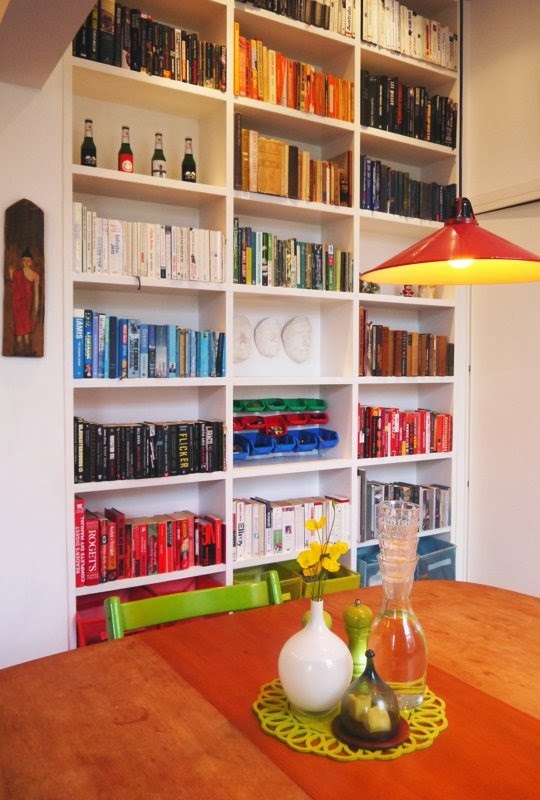 That is a color coded set of bookshelves. JUST LIKE I USED TO HAVE. And every realtor that walked through my house mocked me for having them. I'm a fan of Anne Lamott. Anne Lamott: How did I get sober? Well, when my dad died when I was 25, my younger brother had been 20, my brother Steve, and he worked in landscape architect, he was a laborer, and one of his best friends had a father who was sober, named Jack. When our dad died, Steven moved in with this guy Jack and there were all these sober people around his house all the time talking about how much they loved being sober and prayer and meditation and helping others, and they always had these horrible cakes from Safeway that I happen to really prefer to good bakery, because I mostly just like the icing, and they always had this swill, this terrible coffee. And I was always drinking too much of this swill late at night, whereas if I drink coffee at night, I would sleep again several days later. But, I got to be friends with this character named Jack and he’d been a total lush like I am, and he said, you know, “We’re not drinking, one day at a time, and everything that we’d ever dreamt has happened for us.” And I said, “Well, I’m very religious, very spiritual without your little Safeway cakes and swill." But like most drunks that had gotten sober, I got to the point where I was deteriorating faster than I could lower my standards. You know? So, I was getting to a point where I was living in a way that involved waking up sick and with a lot of shame and just kind of animal confusion. And one day I called Jack and said, “What do I do?” And he said, “Why don’t I come over and we’ll talk.” So, that’s how I got sober and that’s how I stayed sober as people said, “Why don’t I come over and we’ll talk, and drink our bad coffee like communion together." The whole, 'people saying why don't I come over and we'll talk' thing is good for more than just sobriety. It's also good for healing broken hearts. And calming confused minds. And encouraging sad souls. And it's good for grieving moms. And grieving daughters. And grieving wives. And scared kids. And worried dads. And burdened boys. And ... heck. Don't we all long for someone to just come over and talk? I went looking for them (on the internet) and found a source. So I bought a couple thousand. 1. I gained an appreciation for the film industry. All aspects of it, from conception, to materials, to camera angles, to location, to scripts, to editing, to scores, to the scope of projects ... from commercials to movies. 2. This ad just makes me smile. And I found it first. I mean, I viewed it before Clint had discovered it. And I liked it, but never shared it because it could've been lame and I wasn't going to risk calling something cool that wasn't. But when Clint stumbled upon it and called me over to look at it, it really made me smile. 3. It was the beginning of me realizing that Clint was in this for the long run. And that he had some serious skills. And that I was going to support him however I could. And if that meant ordering thousands of neon iridescent bouncy balls from an American bubble gum machine contents wholesaler, then, well, then, OK. Anyway. That was my all-time favorite ad. As a way of justifying my going to the movies alot. Like, a real lot. Like 5 nites in the past 9. And it's all because of Bravia balls. 1. Day One of Nine Days Off was lovely. Day Two will look different. SO thankful for this break. 2. I'm thankful that no one died, or has life threatening injuries as a result of the Apollo Theatre collapse in London. 4. And I'm thankful for The Last Door, and December's Alumni of the Month.